Werner Dabringhaus and Reimund Grimm continue to redefine excellence of artistry and technology with their MDG label. In this case they return to the music of Dutch composer Lex van Delden who was born in Amsterdam as Alexander Zwaap. A pupil of pianist, Cor de Groot, van Delden was largely an autodidact so far as composition was concerned. He was an associate of another leading composer of the inter-war years Sem Dresden best known for his orchestral piece Dansflitsen from 1952. In 1942 van Delden as a Jew was in hiding from the occupying Nazis. Still a student, he joined the Underground. It was wise to use another name and the name Lex van Delden is derived from that assumed name. At the end of the War he discovered that most of his family and friends had been killed by the Nazis. Most of his pre-war compositions were destroyed in the bombing of Nijmegen in 1944. His approximately 125 surviving works, including eight symphonies, were written after the war. The works recorded here are for string quartet or quartet plus one. They are the work of a traditionalist – melodic seasoned with a slightly peppery harmony. Every lines is laid out with wondrous clarity. The language resembles Tippett without the polyphonic complexity. As the years passed Van Delden drew withering fire from the avant-garde orthodoxy not that this dissuaded him from the tonal route. The Musica di Catasto was commissioned for the 150th anniversary of the Land Registry in the Netherlands. The first movement with a radiant classical warmth has a quite recognisable hint of the famous 1812 theme. Overall the music is dark-hued but the bureaucratic commission did nothing to stifle van Delden’s dignified and gracious tunefulness. The earliest piece is the four movement String Quartet I which, across four concentrated movements, is in keeping with the desperation and deep depression that permeated his life at the time. The music moves between the poles of Ravel and Bartók. The String Quartet II is an arrangement of the composer’s Symphony No. 7 for strings. This three movement work has a hesitant flickering grace in the first movement which contrasts with the burnished tension of the third movement finale complete with passing echoes of the string writing in Sibelius 4. The Third Quartet was commissioned by a wealthy artlover and collector of the paintings of Carel Willink (1900-1983). The paintings that inspired each of the four movements are most superbly reproduced in the centre of the booklet. The music is glowingly urgent in the outside movements and in the central pair incisive and then sweetly tender in the manner of Tippett’s Concerto for Double String Orchestra. The finale takes us back into that sincere lyricism so typical of the middle movement of the Tippett Triple Concerto. 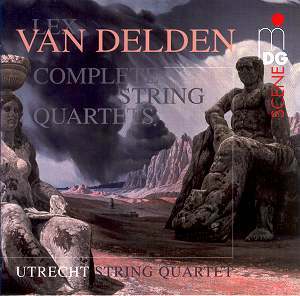 This disc is partner to another van Delden CD from MDG: Quartetto op. 58 (1957) for flute, violin, viola and violoncello; Sestetto per Archi op. 97 (1971) for 2 violins, 2 violas and 2 violoncellos; Duo per Flauto ed Arpa op. 27 (1950) for flute and harp; Introduzione e Danza (Judith) op. 26 (1950) for flute, clarinet, violin, viola, violoncello and piano and the Nonetto per Amsterdam op. 101 (1975) for clarinet, bassoon, horn, 2 violins, viola, violoncello, double-bass and piano. The Viotta Ensemble and members of the Royal Concertgebouw Orchestra can be heard on MDG 603 1317-2 (see review). Vivid, vigorous and accessible music, stunningly played and recorded with faithful immediacy.